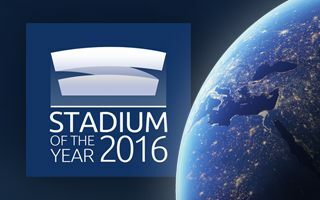 Stadium of the Year 2016: Join the global vote! After a slight delay yesterday we now have the voting platform ready for your engagement. And before we managed to write this article, a stunning 1,000 votes have been cast already! We’re off to a great start of Stadium of the Year 2016 so be sure to get involved. Browse through the list and select five stadiums you prefer over others. Give 5 stars to the favourite, 4 stars to the 2nd and so on until you give out the 1-star mark. Then press Vote! and you’re done. Please mind, the system will only accept one vote from your device so choose wisely. Also today the Jury Vote begins and will run simultaneously with the Public Vote. The Jury includes experienced stadium architects from five countries. Both votes will result in independent Stadium of the Year titles, which will be granted to two stadiums unless one of them wins in both votes. That hasn’t happened before but who knows? Final results of Stadium of the Year 2016 will be presented on March 6 (Jury Vote) and March 7 (Public Vote). And now join the vote!